Maybe you are thinking there is no novelty- a braid is a braid, nothing spectacular about it, but you haven’t seen these twisted and complex plaits. 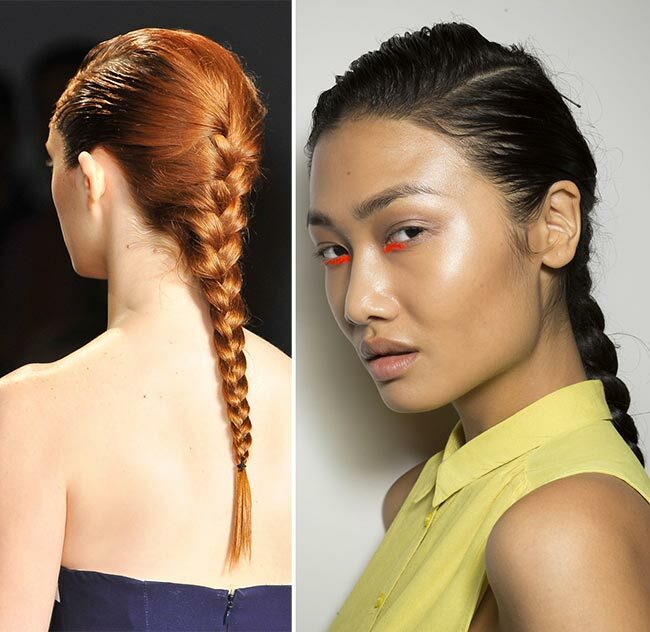 We present you a few of our hottest and out of the box braided runway moments. 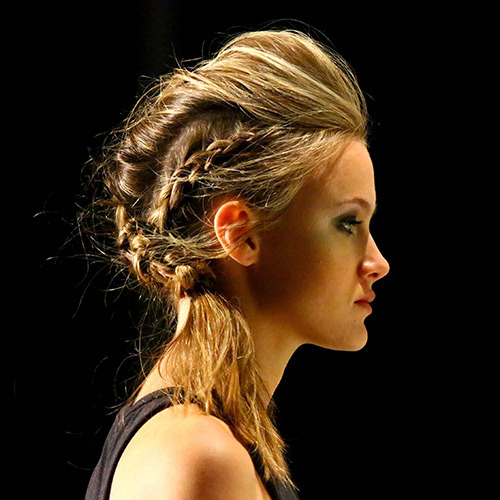 Orlando Pita enhanced the floral, delicate patterns with a messy, disheveled texture. 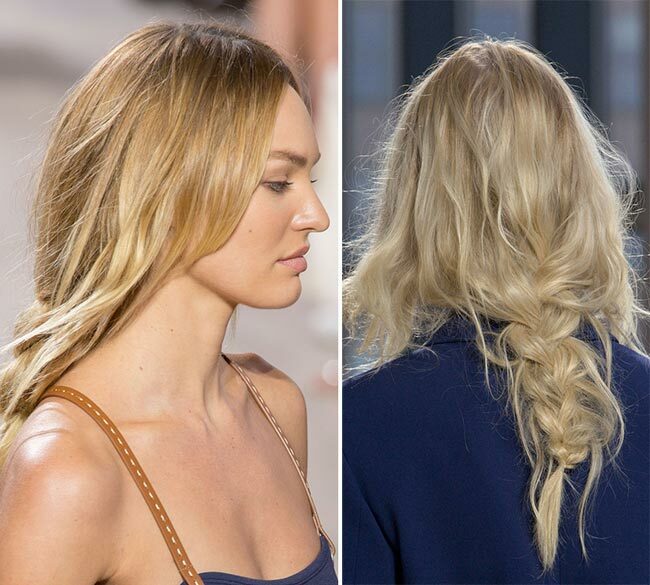 He added extensions or piece-y layers, where needed and misted the strands with dry shampoo. 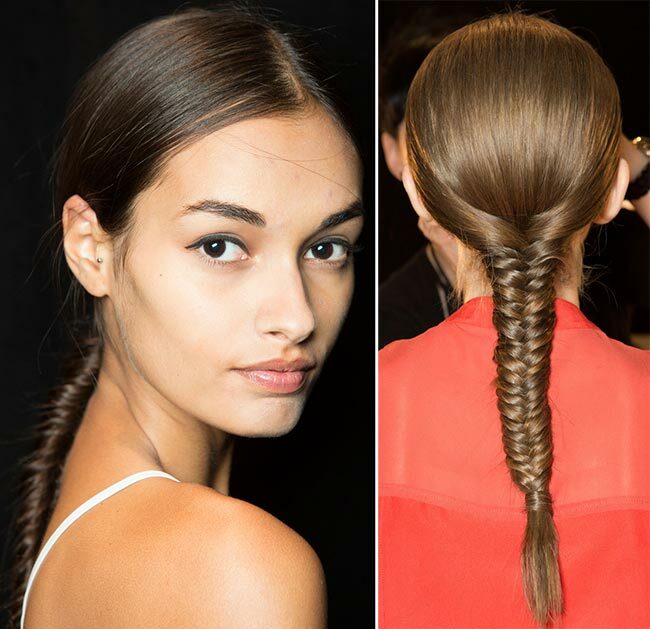 He braided the strands into a loose, low plait then pulled out a few strands for a whimsical result. 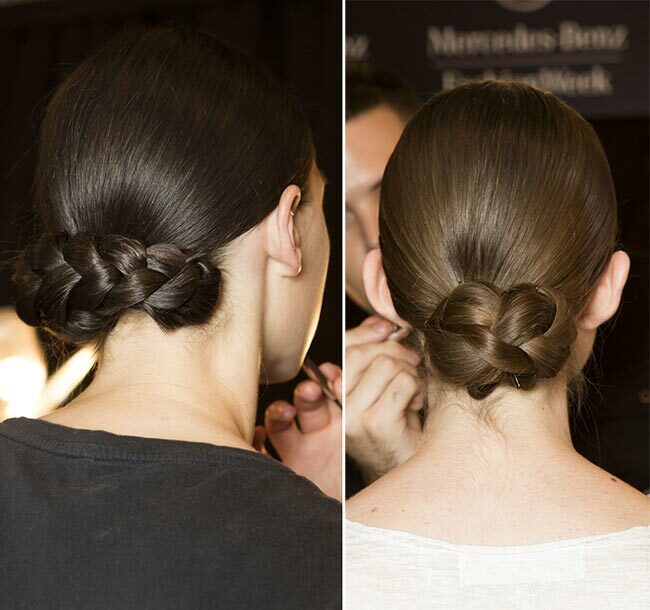 The two braided looks at Marissa Webb were created by Jeannie Syfu for Tresemmé. The first was a delirious pompadour featuring three braids: two Dutch braids along the sides and a relaxed French braid down the center, all linked into a bun ending in a little pony tail. 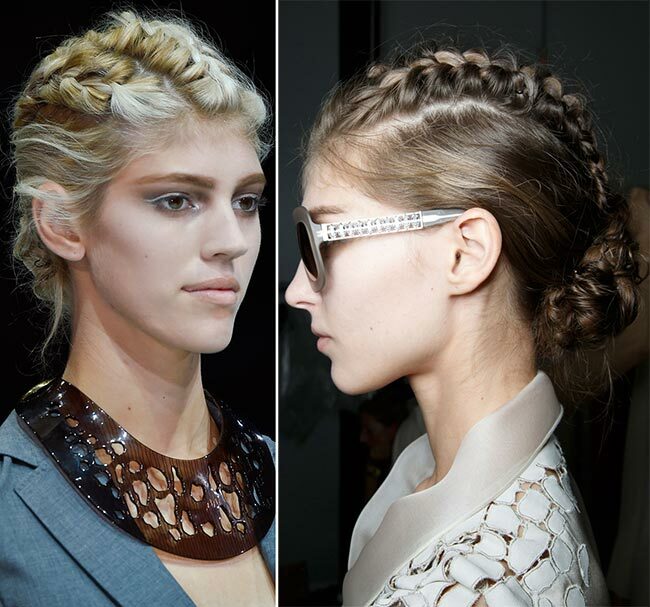 The second style was a five-strand plait creation, which took a sophisticated basket-weave design at the end. It was all about the creation of the masculine braid by Eugene Souleiman: the style had a wet effect on the front part of the hair and metamorphosed into a feminine, simple braid flowing down the back. The all-American look was given by the strands being braided very close to the scalp. 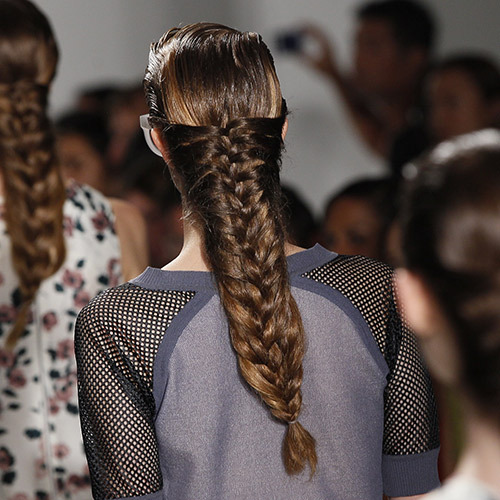 During Suno’s spring 2015 collection show at New York Fashion Week stylist Odile Gilbert astounded us with an exaggerated fishtail braid, which seemed like a hybrid between a simple french braid and a fishtail. 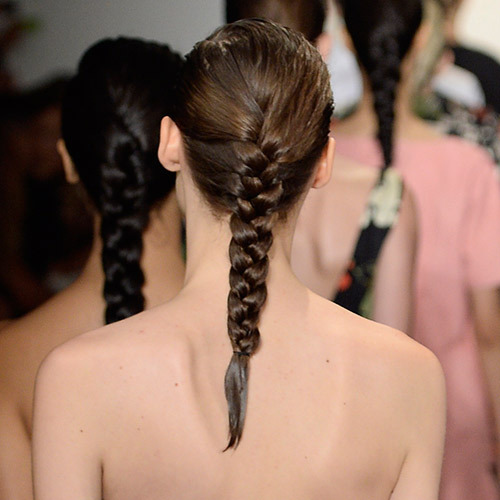 Even if enormous, the braids conferred elegant simplicity to Suno models. 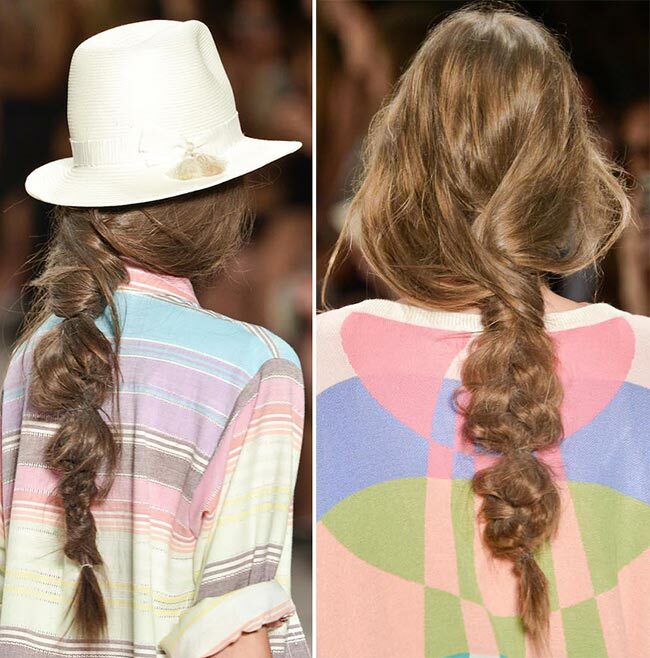 On Mara Hoffman catwalk, stylist Nick Irwin invented a new type of braid. 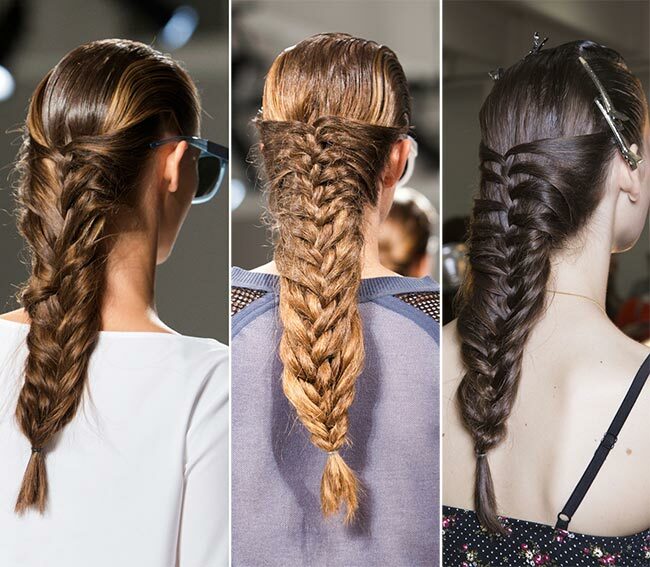 To get the desert braids, the hairstylist advises us to mist the plait with dry shampoo before blow drying to get a good grip then use a kneading technique to loosen the plait and get the bubbly effect. This braided chignon appeared to be almost alien-like or if you have an earthy point of view resembled to Heidi’s hair with the Dutch braid down the center and the hanging braids on the sides. 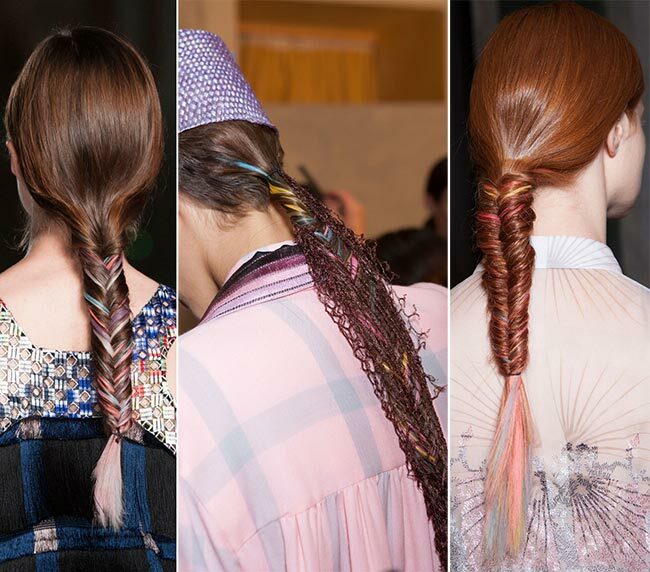 Multicolored ribbons in blue, pink and yellow were combined into ordinary long fishtail braids transforming them into sophisticated and unique combinations. The colourfull hairstyled resonated the designer’s prismatic silk fringe dresses. The Giorgio Armani collection runway abounded with romance spread by the graceful cornrows braided into complicated poetic knots, perfected with a natural make-up and strong eyebrows. All of them creating an intricate attire. Hairstylist Pepper Pastor created a braid within a braid: a mixture between a ponytail adorned with two smaller braids and a side-swept headband, which wrapped it all in a bohemian appearance. Hairstyles were inspired by ’20s rebel Nancy Cunard and a double-themed look was created by Amit Abraham. 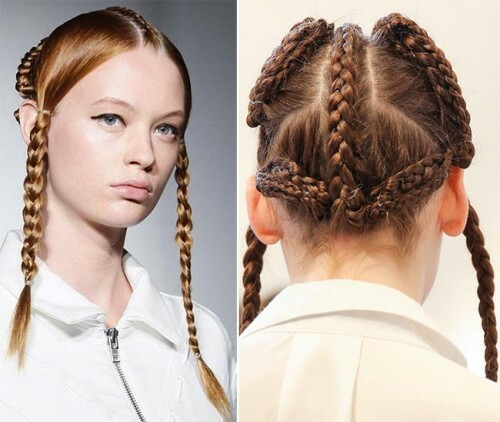 The models were wearing edgy braided ladylike chignons with a leather string inserted into the braids. 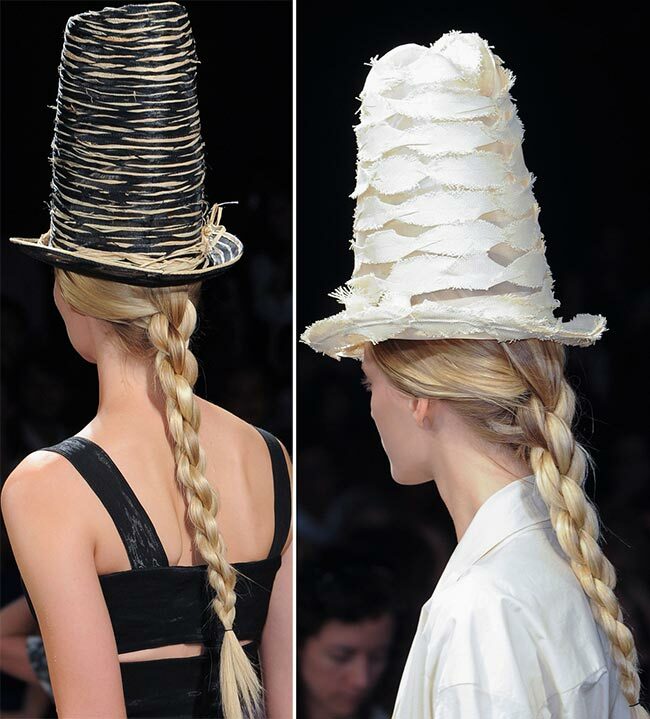 Eugene Souleiman stunned us again with the long bulky rope, yet totally glam braids featured by oversized hats. 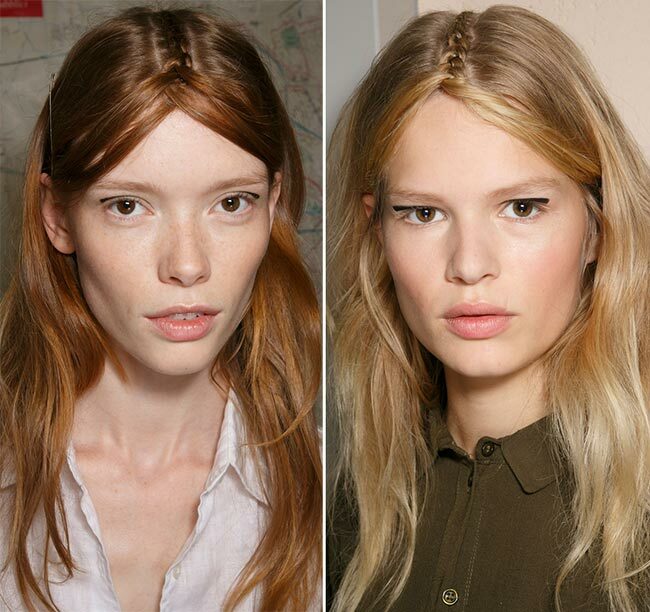 The minimalistic hairstyle was created with four strands of hair and it took two people to do. The look was drenched in elegance and sophistication. 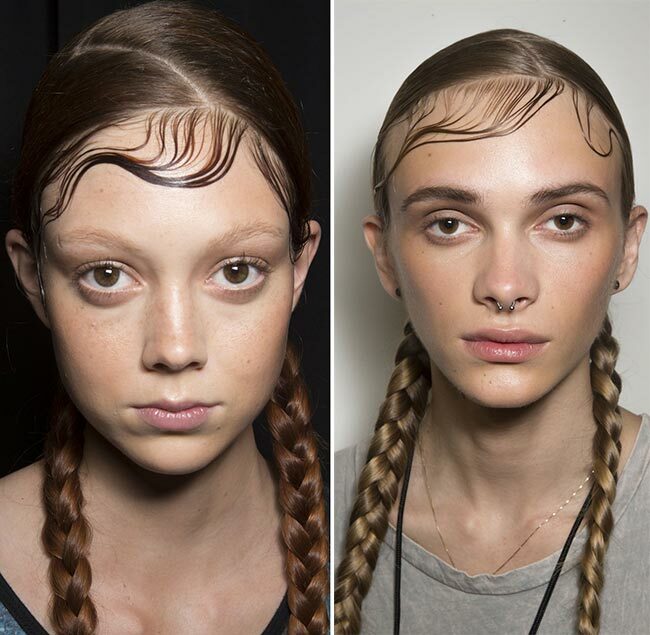 Donna Karan used braids for the DKNY collection presentation also, but a sporty version of them- an edgy wet look (gelled baby hairs), zigzag partings and glossy pigtail braids- all was inspired by the 80s and 90s street girl look with a natural make up. 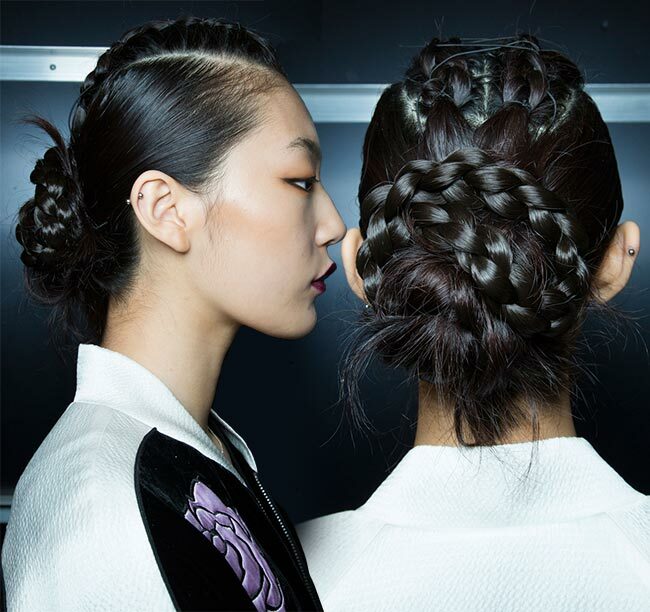 Rodney Cutler’s horizontal chignon braid is actually a simple plait rolled under and pinnned up into an elegant bun, inspired by the way Tadashi Shoji interpreted the Venetian lace and varied textures in his Spring-Summer 2015 collection. Hairstylist Lauren McCowan used an interpretation of the classic fishtail braid, inspired by the traditional Indian touches in the clothing collection, hence the single low fishtail braid with a middle part is a popular Indian wedding harstyle. 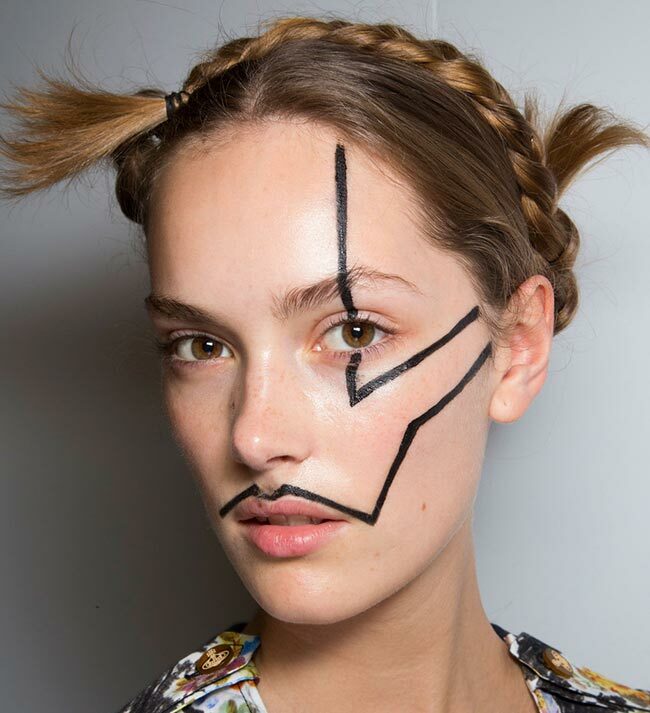 Vivienne Westwood echoed the playfulness of the makeup by adding a modern and unique touch to the classic milkmaid braids, bringing the look nowadays through an unfinished and clumsy updo.